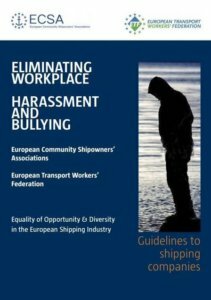 On 29 January 2014, the European social partners in the maritime sector (ETF and ECSA) presented a training package that aims to eliminate workplace harassment and bullying in the shipping sector. The package addresses the maritime community at large to identify and effectively fight against these practices, which continue to be an issue in the sector. The training package was presented in a conference, organised in Brussels in the context of an EU-funded project jointly carried out by ETF and ECSA. At the conference, attended by representatives from the International Labour Organisation (ILO), national training institutes, workers’ and employers’ organisations, officials from the European Commission congratulated in their opening speeches the project partners with the outcomes: “This project is fully in line with the Commission’s priorities for the maritime sector, it is likely to improve its attractiveness and make a difference when it comes to promote high standards of working and living conditions” G. Crivellaro (DG MOVE ) and F. Ziegler (DG EMPL) stated. Bullying and harassment remain a problem in the sector; it goes often unreported and takes a variety of forms, as for example the growing phenomenon of cyber-bullying. The training toolkit, containing guidelines, a training video and a workbook, will help seafarers and shipping companies to identify and deal with incidents. In order to ensure the widest possible dissemination, the guidelines will be made available in 23 languages, and the video will be subtitled in 11 languages. To this end, the experts taking part in the panel discussion also committed themselves to promote and disseminate at their levels and within their networks the tools developed in the context of this project. The training package is now available on the ETF website.